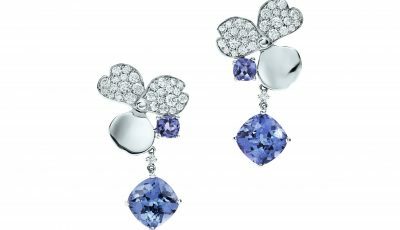 Tiffany & Co., which has a store in South Coast Plaza, has unveiled its 2018 Blue Book Collection: The Four Seasons of Tiffany. 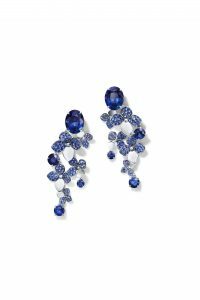 Composed of five themes—winter, spring, summer, autumn and color theory—the new high jewelry collection draws inspiration from flora, fauna and the architectural complexity found in nature. With modern and graphic shapes rendered with rare techniques and exceptional gemstones, each piece in the Tiffany Blue Book Collection is a unique creation. “The Tiffany Blue Book Collection serves as a laboratory for developing groundbreaking concepts that will one day make their way into new collections. It’s where our most creative, experimental and innovative ideas begin,” explained Reed Krakoff, chief artistic officer, Tiffany & Co. Within the winter theme is an ice motif, which required skilled craftsmen to study the beauty of irregularity and render it in diamonds. The illusion of ice was achieved by individually cutting each diamond into jagged, unique shapes that mimic an iceberg adrift on a sea of platinum. A magnificent yet delicate necklace is composed of over 91 total carats of 237 uniquely cut diamonds that connect like an intricate puzzle. “The idea of ice was more a suggestion of irregularity and the seamlessness of ice when it’s cracked and broken. We wanted to suggest the idea of these things rather than creating a representation of them,” said Krakoff of the design process. 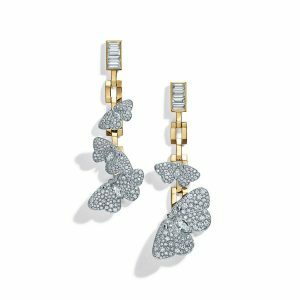 The spring theme builds on the randomness and asymmetrical beauty of the natural world, while in summer, fluttery diamond encrusted moths contrast against the bold, angular links. An 18k yellow gold bracelet anchors different size moths that appear to be in flight or landing. The moths were created with 1,115 round brilliant diamonds of over 6 carats and 23 marquise diamonds set in platinum. Autumn reveals a lightness and interplay of gemstone colors and cuts, while the color theory theme offers color gradation ranging from intensely saturated colored gemstones to white diamonds. 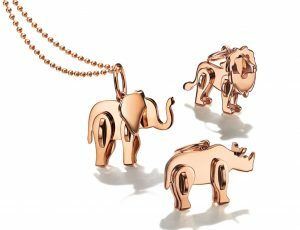 Tiffany & Co. has also unveiled its Tiffany Save the Wild Collection, which has expanded to include lions and rhinos in addition to elephants, all in support of the Wildlife Conservation Network and its innovative crisis funds to save endangered African wildlife. As part of Tiffany’s ongoing commitment to sustainability and conservation, 100 percent of the profits from the Tiffany Save the Wild Collection will support the protection of the respective endangered species: the elephant, rhino and lion. Tiffany & Co. is particularly dedicated to the wellbeing of the African continent, where the company sources many of its diamonds and gemstones. After launching the collection in 2017, Tiffany has already more than doubled its original commitment, with $2 million raised as of April 2018 going to support the best investments in anti-poaching, anti-trafficking and ivory demand reduction. As a result, Tiffany’s Wildlife Conservation Network’s Elephant Crisis Fund, together with its partners, has successfully lobbied for the closure of China and Hong Kong’s domestic ivory trade. 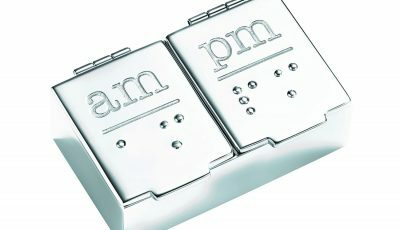 Tiffany will pledge an additional $2 million minimum commitment by January 31, 2020. With these new charms, Tiffany continues its ongoing efforts to both raise public awareness and contribute the financial resources needed to protect endangered wildlife and their imperiled ecosystems. Since its inception in 2000, The Tiffany & Co. Foundation has awarded more than $70 million in grants focused on conservation efforts, including coral and marine conservation, and responsible mining. The Foundation’s mission to preserve the world’s most treasured landscapes and seascapes aligns seamlessly with Tiffany’s complementary commitment to conservation. Something else is true about Tiffany—it’s Tiffany True, the new Tiffany & Co. engagement ring that we’re told is destined to become another icon of the brand. Named Tiffany True for its ability to captivate, this new fancy-cut diamond exposes more surface area on the diamond’s main facet, enhancing its luster through heightened contrast and dispersed light. In the Tiffany tradition, Tiffany True favors beauty over the weight of the diamond. Available in platinum with a colorless True cut diamond, or 18k yellow gold with a fancy yellow cushion modified brilliant diamond, Tiffany True debuted this autumn in North America.